In this section, we’ve addressed some of the more common questions asked about living with an artificial eye after retinoblastoma treatment. Please do email us at support@chect.org.uk if you would like any further support. What does an artificial eye look like? Most artificial eyes are concave in shape, similar to a contact lens only much thicker and not clear. The eye will be colour matched to your natural eye and hand painted. 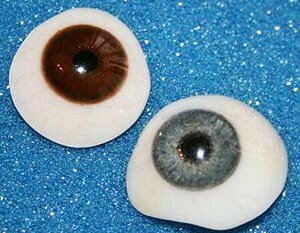 An artificial eye is made from a synthetic resin which does not break. It is placed over the ocular implant which remains in the socket. Artificial eyes will survive a great deal; being dropped, trodden on, and even swallowed by the dog or child (yes – it has happened). How often should you clean an artificial eye? The more often the eye is removed, the greater the risk of infection. However, the eye and socket need to be kept clean so it is you will need to find the right balance between the two. Some people remove their eye/s every day and wash them as part of their routine, like cleaning their teeth. Others do not remove their eye/s at all between check ups. With children, it is important to get them used to the removal process as soon as possible, starting with cleaning around the eye regularly and then building up to removal, over time. Will my artificial eye move? When an eye is removed, an ocular implant – like a small ball – is inserted and attached to the eye muscles. The implant will then move in unison with the remaining eye. The better the fit of the artificial eye, the more movement there is likely to be. The comfort and fit of an artificial eye will vary throughout life and may be affected by colds, stress, distress, puberty and menopause, etc. It is likely to need replacing at regular intervals to ensure a good fit and best cosmetic outcome. Does the other eye need protection? There are conflicting opinions on this subject. Some professionals will say children do not need to do anything additional to protect their eye but that contact sports should be avoided. Others may advise that all sports can be played as long as special protective glasses or goggles are worn. You will need to decide what is best for your own situation. See our section on sports goggles and protective eyewear. Speak to the health professionals involved in your child’s care and your local optician for more information. Do you get a spare eye? No – but when your child has their second eye made they will be able to keep the old eye, although it won’t fit as well as the new one. What happens at artificial eye appointments? 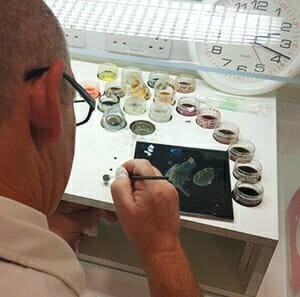 At most appointments, the artificial eye(s) will be removed, cleaned, checked for any abrasions or deposits and polished. When needed, a new eye may be made. When your child is at this stage, a mould of their socket will be taken and a new prosthetic eye created from that. It may take time before your child is ready for this step. If you have problems with your child’s eye between appointments, contact your prosthetist or your Rb team for advice. It is not uncommon for parents to find it difficult to manage their child’s artificial eye, particularly in the early stages when the child is unable or not old enough to handle it themselves. Your Rb play specialist or clinical nurse specialist can suggest ways to help you and your child manage this and feel more at ease with the process. If you would like to talk to someone about this, please call us on 020 7377 5578 or email support@chect.org.uk.